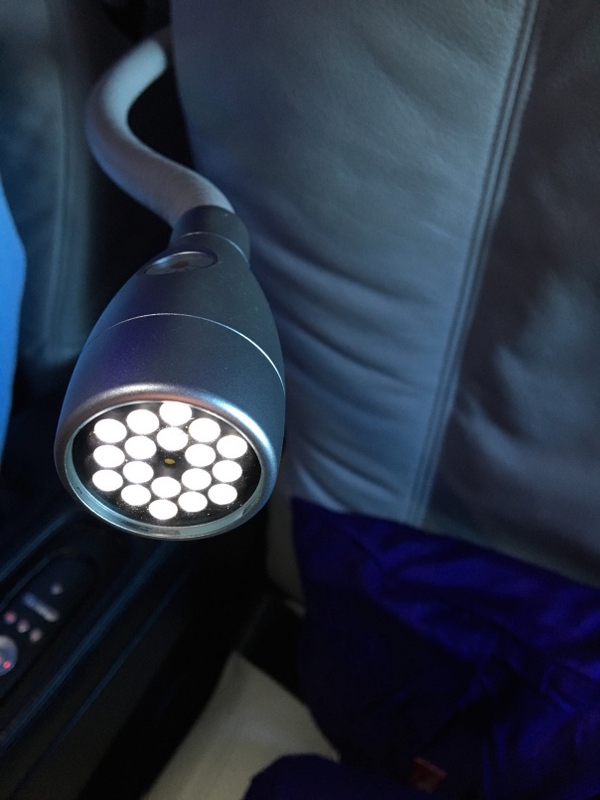 This youthful and modern airline offers a solid premium cabin product in the US domestic market, which historically suffers from a lack of innovation and motivation compared to other regions of the world. 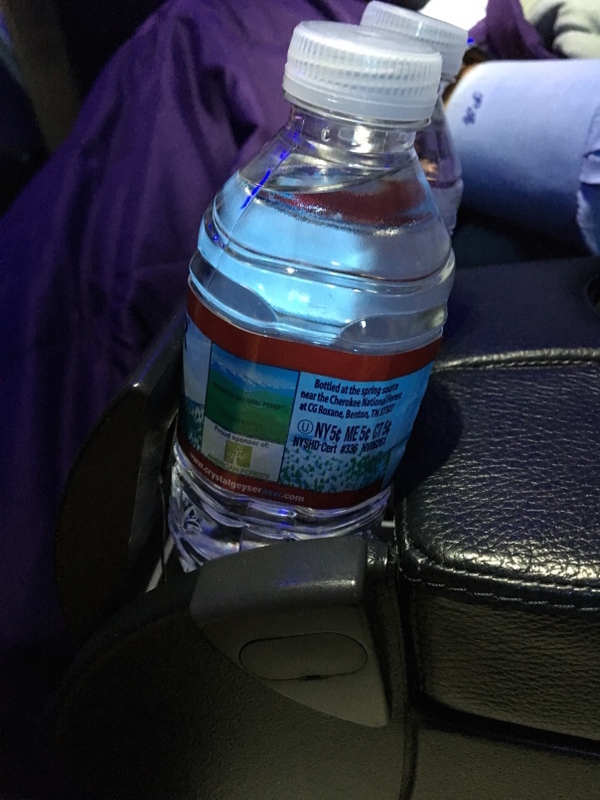 I was lucky enough to try it out on a recent direct flight from San Francisco to my home base of Austin. I purchased a ticket outright during a sale for $399 USD. 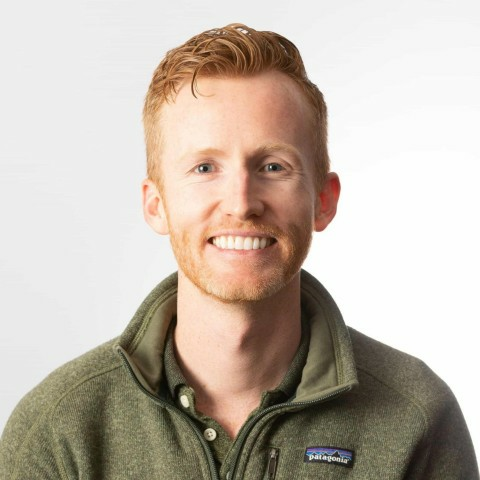 Point Hacks overview guides offer an introduction to the airline, cabin and seats, and touch on how to use your own points to redeem for your own trip, alongside our own personal experiences. 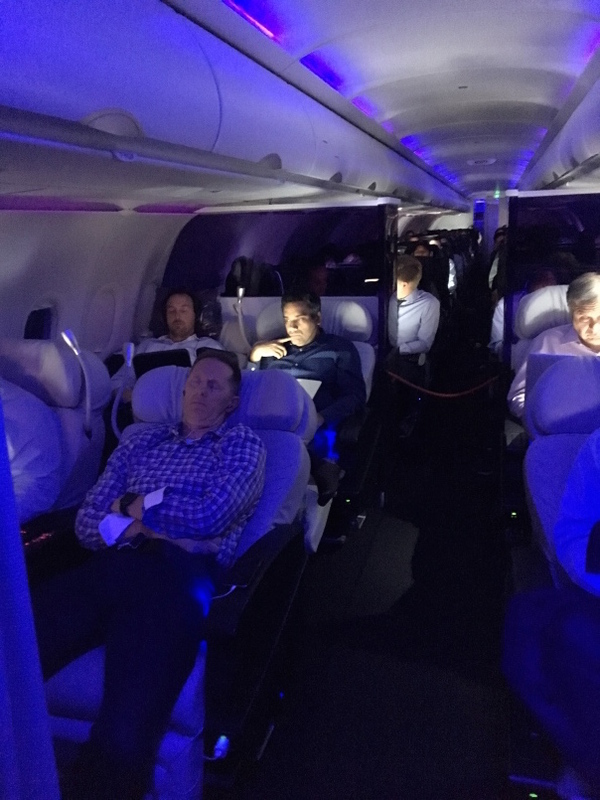 Virgin America has been around since 2007, but this year was bought by Alaska Airlines. The merger has not yet taken place, so as of now, the information in this overview is correct, however we will update it when new information comes to light, especially in terms of award redemption changes. 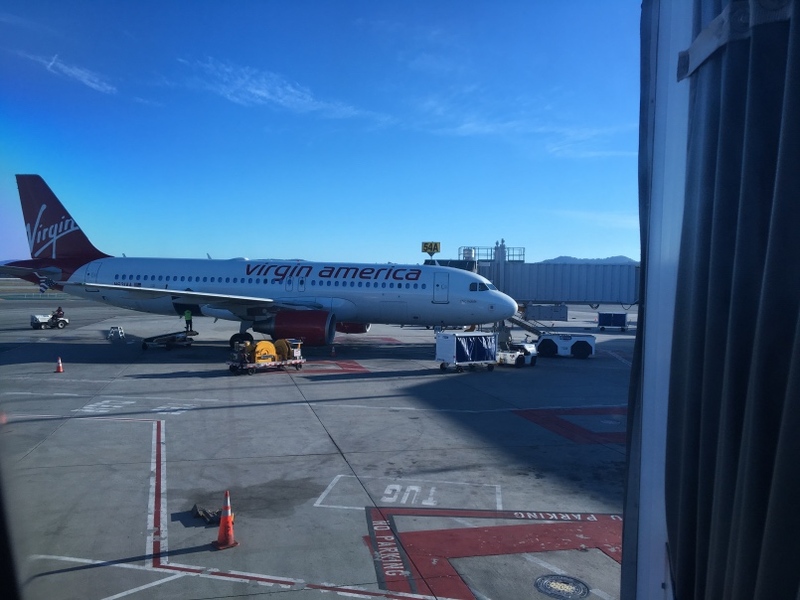 Virgin America has its biggest hub at its San Francisco headquarters, where you can access the fantastic Virgin Atlantic Clubhouse (reviewed here) for $40 USD when flying Virgin America First Class or Main Cabin Select or as an Elevate member. Their focus cities are Los Angeles and Dallas Love Field. Do note that Dallas Love Field is a different airport than the much larger Dallas/Fort Worth Airport, a 20-30 minute car ride away. It basically operates just one type of aircraft: the Airbus A320. It does have some A319s, which are slightly shorter, and has longer A320neo aircraft on order for delivery over the next five years. Update 1: You will not be able to redeem Velocity points on Virgin America flights from 30 September 2017, however, you can still transfer your Velocity points to KrisFlyer for redemptions after that. 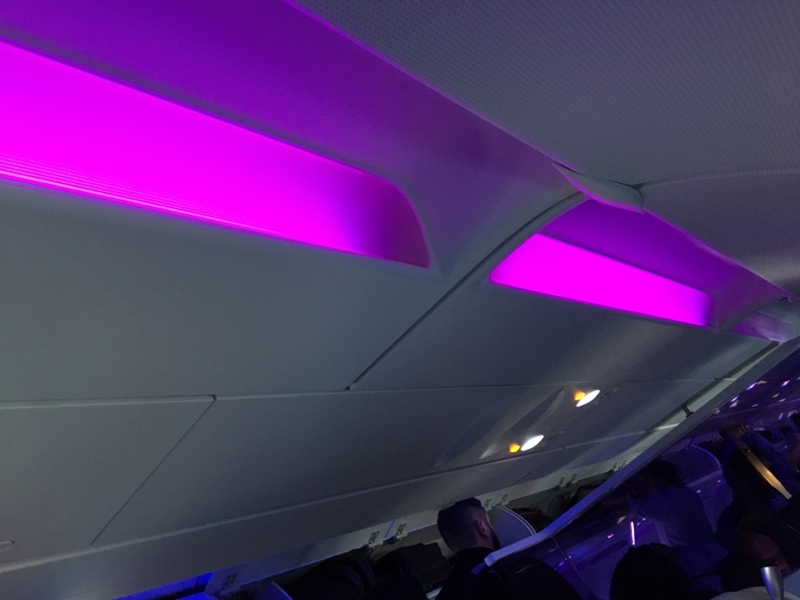 Update 2: you can now also redeem British Airways Avios and American Airlines AAdvantage miles for Virgin America travel from 25 April 2018. 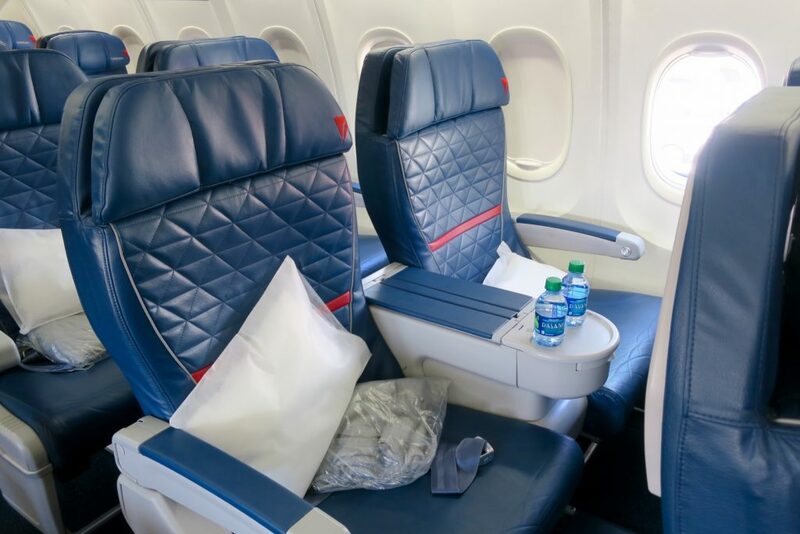 For AA, you can search and book on aa.com; for Avios, you can search for availability on the Alaska Airlines website but you need to call British Airways to book. 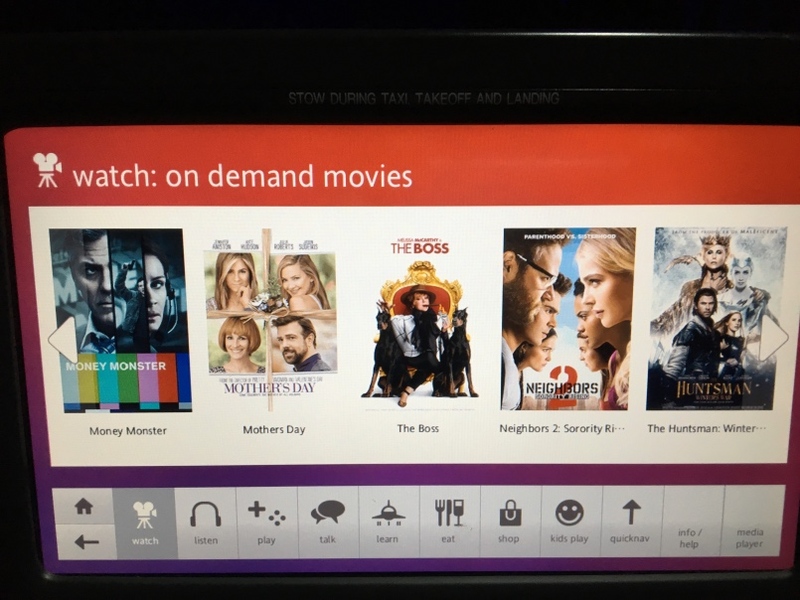 The two main partners that we in Australia and New Zealand use for redemptions on Virgin America are Virgin Australia’s Velocity and Singapore Airlines’ KrisFlyer program. 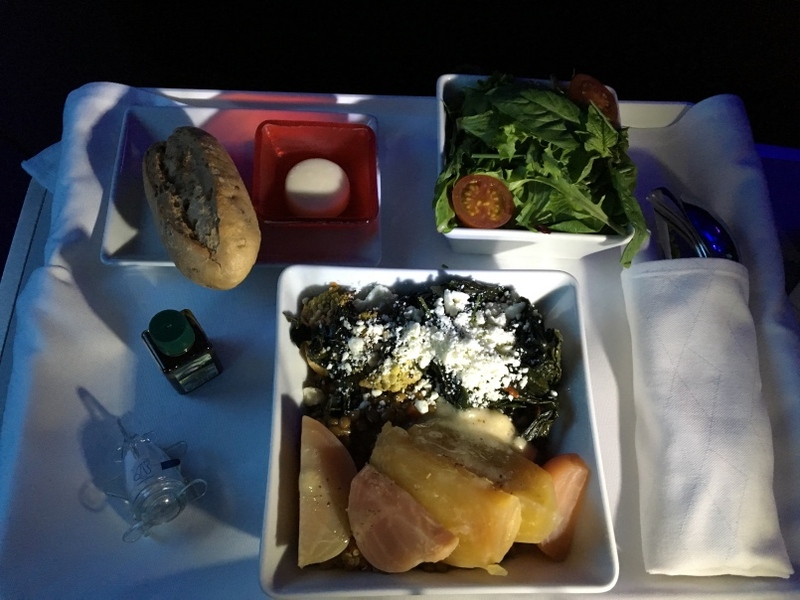 Note that ‘First’ Class is really Business Class on flights within the US, no matter what the airline tries to tell you, and even its partners price Virgin America’s premium cabin as Business Class flights. As you may already know, airport taxes are low in the US, currently pricing at $5.60 USD per segment. Fuel surcharges on US carriers like Virgin America are zero in most cases. Velocity prices Virgin America redemptions the same as travel on Virgin Australia, in the cheaper Table 1. The cheapest redemptions are short hops like Los Angeles to Las Vegas, which cost 15,500 Velocity Points, the same as Sydney to Melbourne. 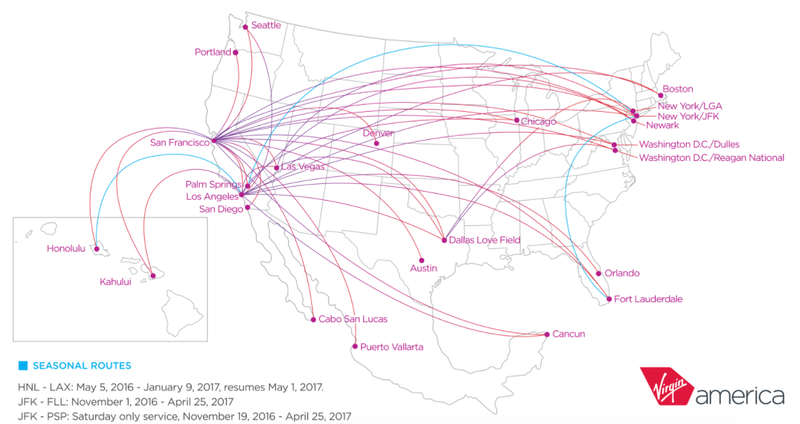 The most expensive redemptions are for flights between the West Coast and the East Coast, as well as between the West Coast and Hawaii, which max out at 49,500 Velocity Points. In our opinion, this is quite a reasonable cost for a 4-6 hour flight. You can check the distances between airports and award pricing on the Velocity website. KrisFlyer has a region-based award chart for Virgin America, different to Velocity’s distance-based chart. 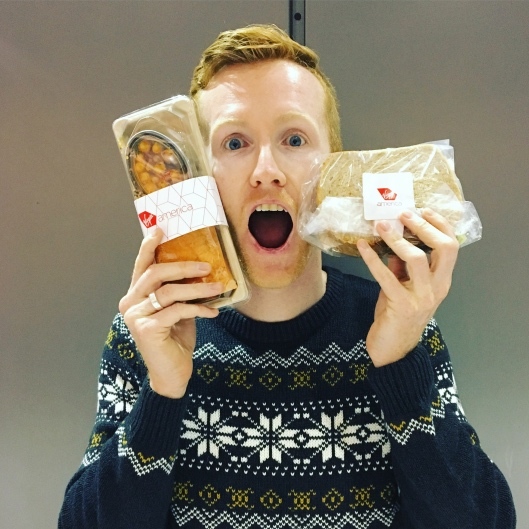 Velocity vs KrisFlyer redemptions – who wins? 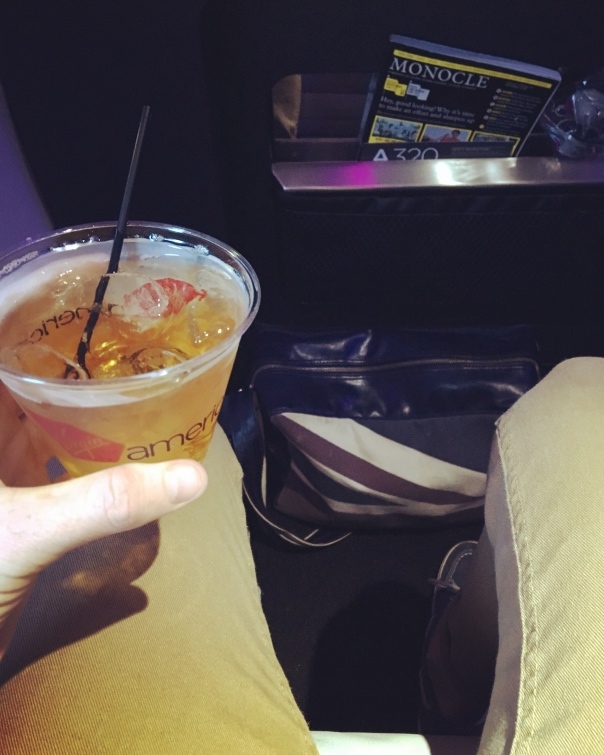 Redemptions on Virgin America are cheaper through Velocity rather than KrisFlyer. Due to their unique partnership, you can transfer points between Velocity and KrisFlyer. Note that if you are travelling to Hawaii, the flights from San Francisco just creep in under the 2400-mile limit for 35,500 Velocity Points rather than the longer flights from Los Angeles for 49,500, so you’ll save points by flying from San Francisco. 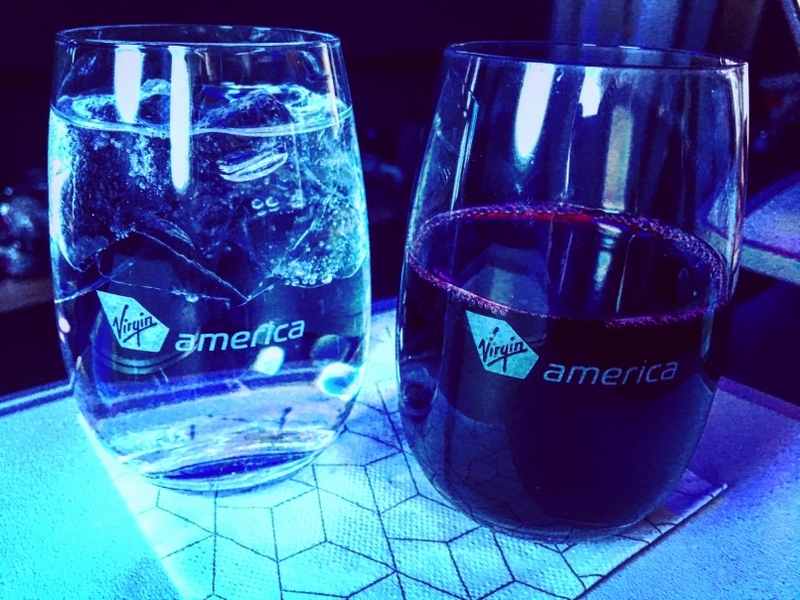 Another reason to use your Velocity Points on a Virgin America flight is that Velocity runs a yearly bonus points transfer promotion from most credit card points programs in November, with 15% offered throughout November 2016. 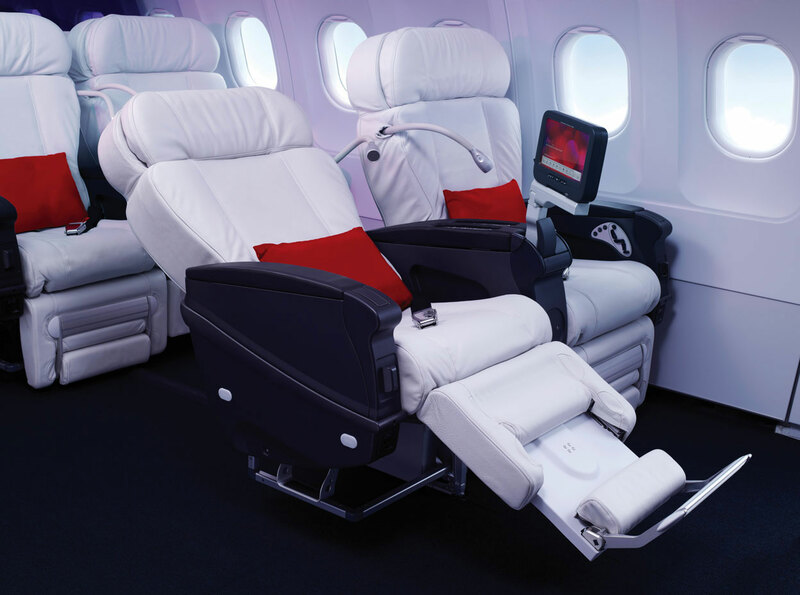 The First Class cabin is arranged in a 2-2 configuration across two rows, for a total of eight seats, with Main Cabin Select (Premium Economy) and Main Cabin (Economy) following in a 3-3 configuration. 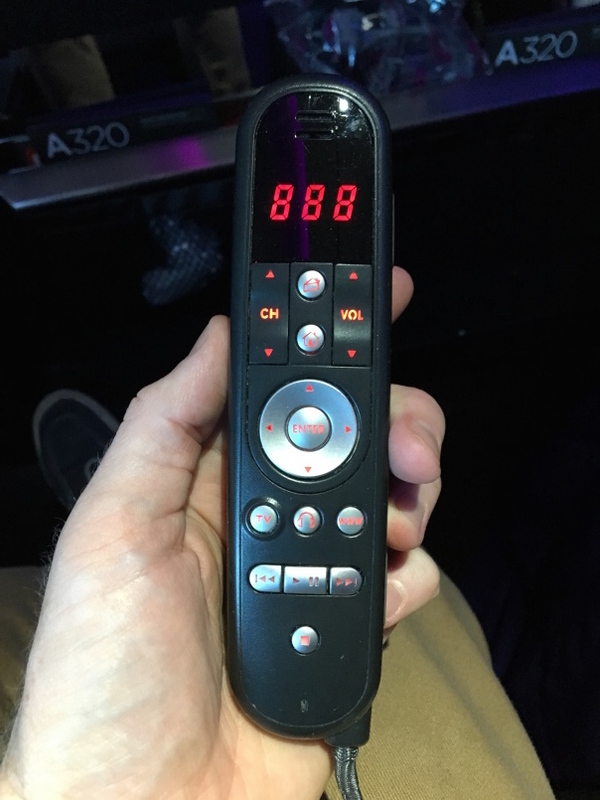 This is standard for US domestic flights. 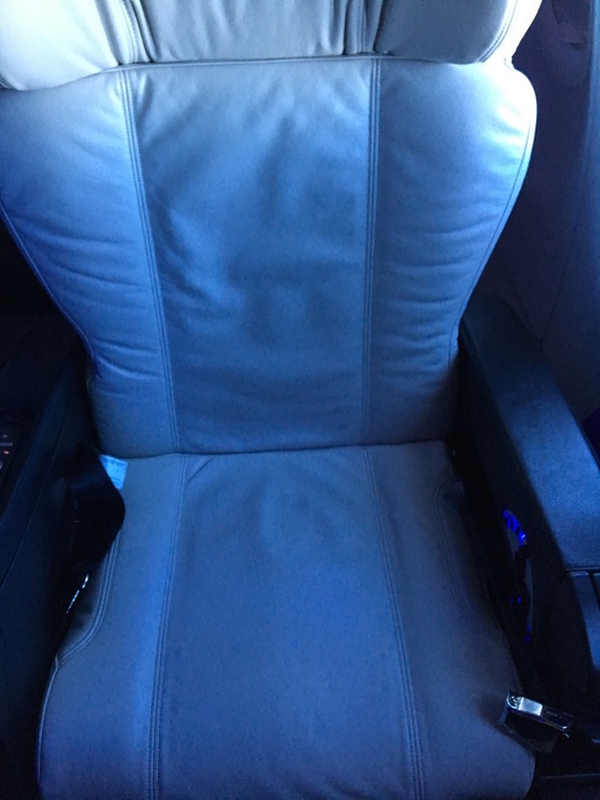 I would recommend 1F and 1D as the best seats in the First Class cabin as they are diagonal from the lavatory instead of galley, where light shines through. There is not much difference in the legroom between Row 1 (bulkhead) and 2. 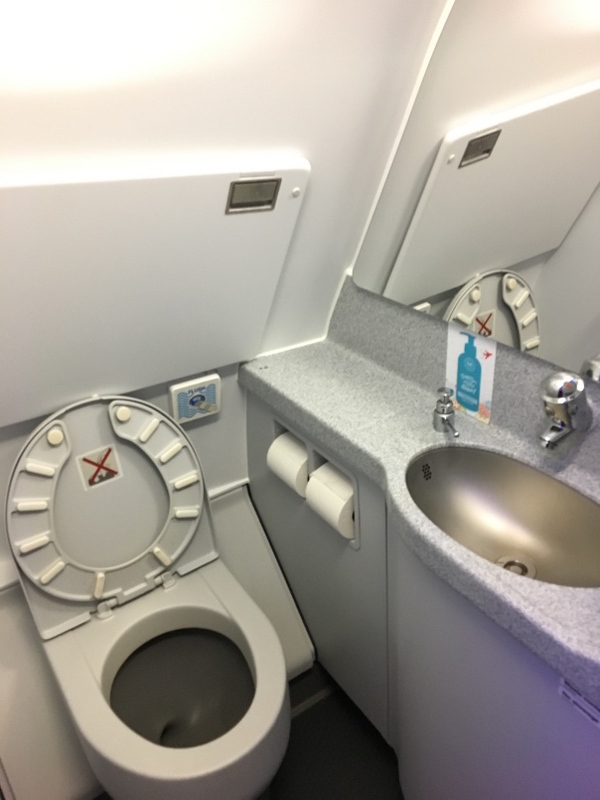 There is one lavatory for the First Class cabin, and two at the rear of the plane. 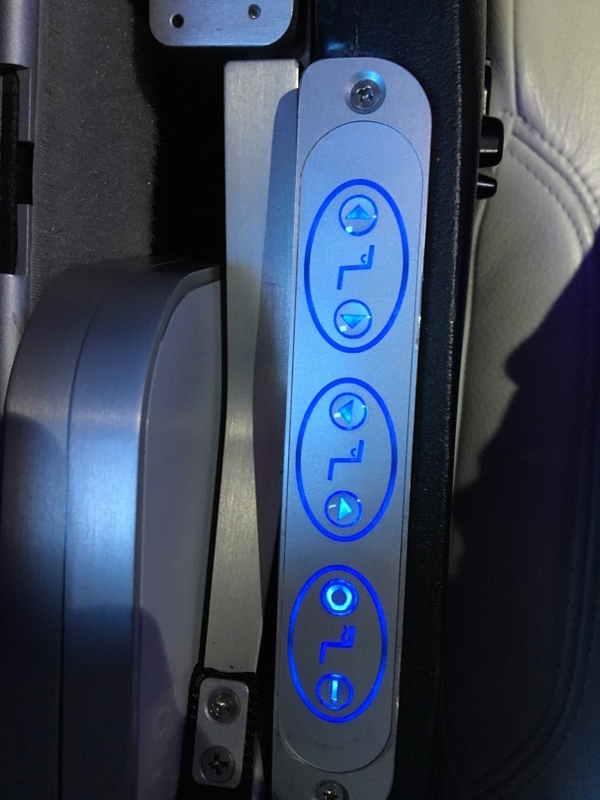 The seat is on the more comfortable side for the US domestic carriers, quite cushy and with an adjustable headrest. 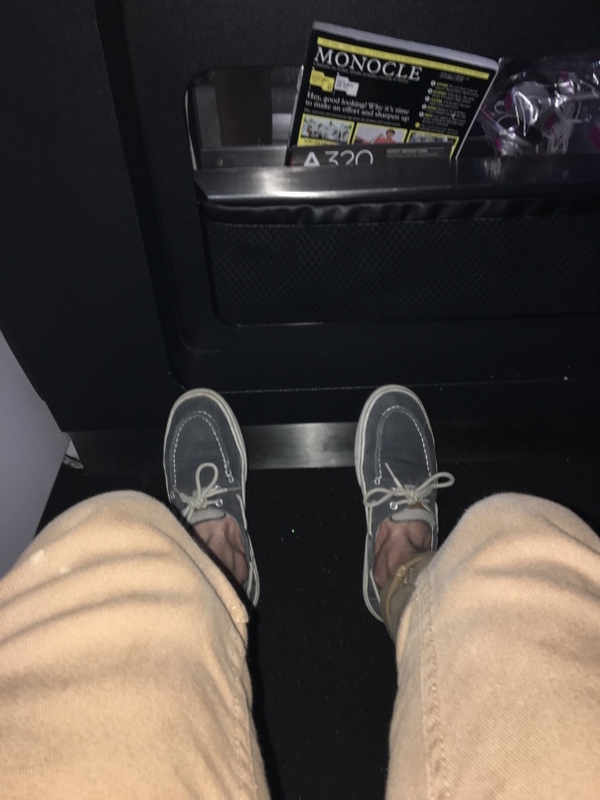 I was seated at 1A and to give you an idea, I’m 5’10” and my feet didn’t touch the bulkhead in front. 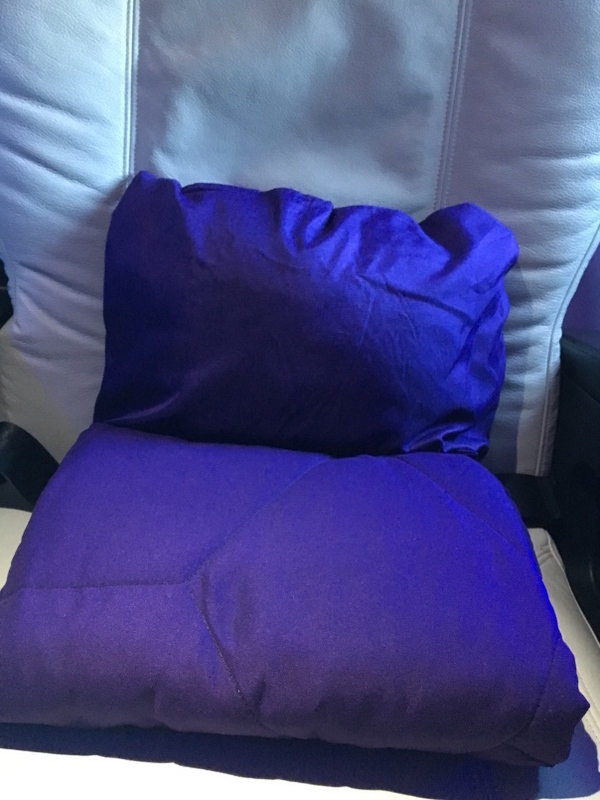 You are given a pillow and blanket. 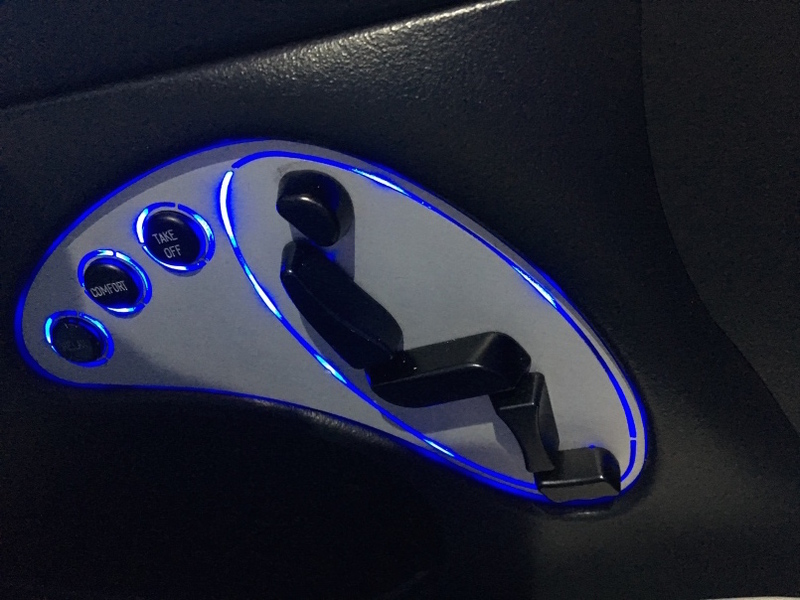 It’s comfortable and warm – think a chilly autumn night. After take-off, there was another quick drink service, and all drinks were served in branded glasses (see featured image) from this point on, which was a nice touch. My meal overall was very flavoursome. The main of feta, quinoa and beet salad was salty with the feta, filling and served at an ideal temperature. The side salad looked poor with two cherry tomatoes and leafy greens but it had a kick, especially with the balsamic vinegar and olive oil. The dessert brownie was so rich it could’ve satisfied three people. 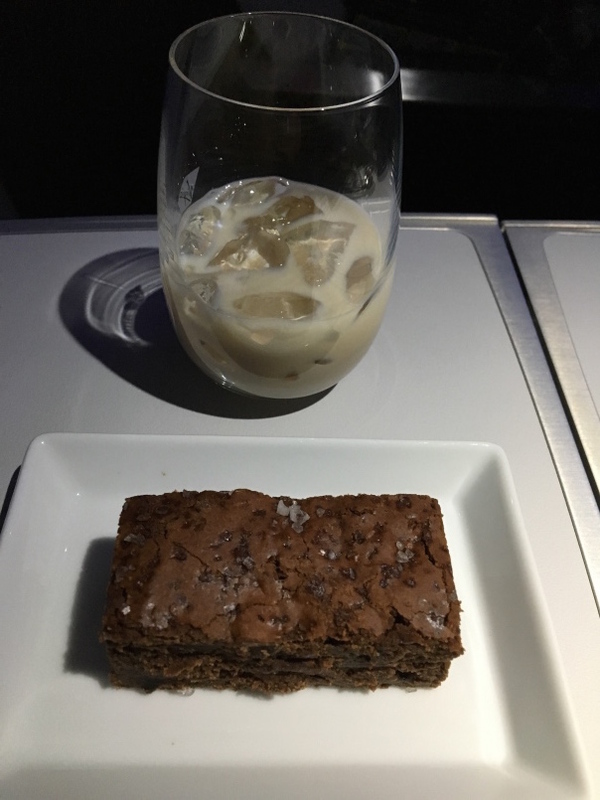 I coupled it with a Bailey’s on the rocks. 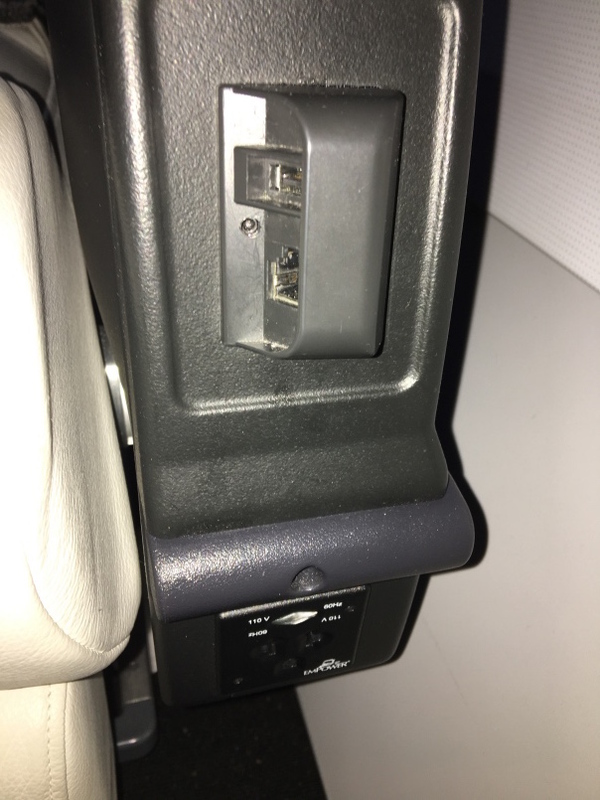 The inflight entertainment system was heavy to lift out of the armrest, but once mounted was quick to load and easy to navigate. 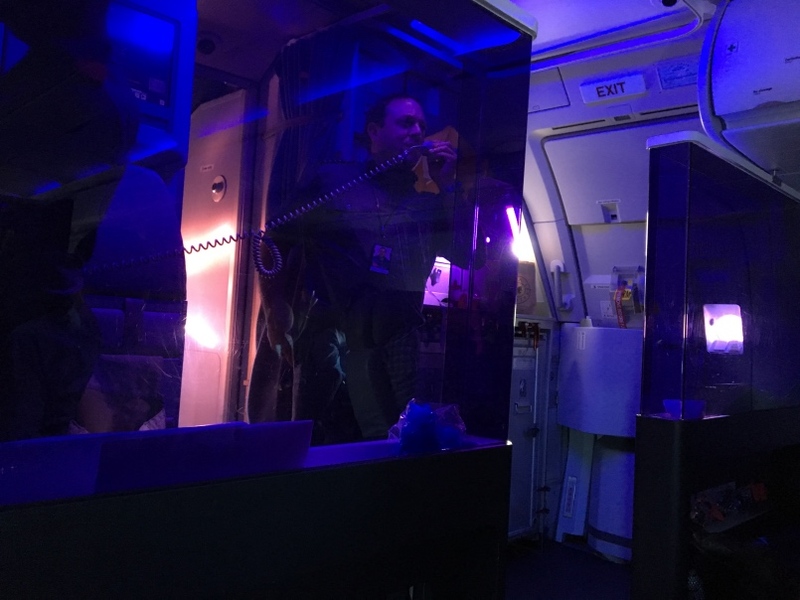 Contradictory to high customer service standards on the ground (due to its tipping culture), we have come to expect little in the air when flying US airlines. 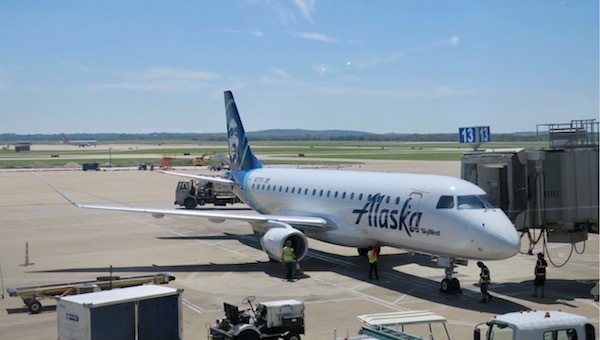 Delta, JetBlue, Virgin America and Southwest generally lead the pack, with American Airlines in the middle, and United and ultra-low-cost carriers like Spirit and Frontier in the rear. 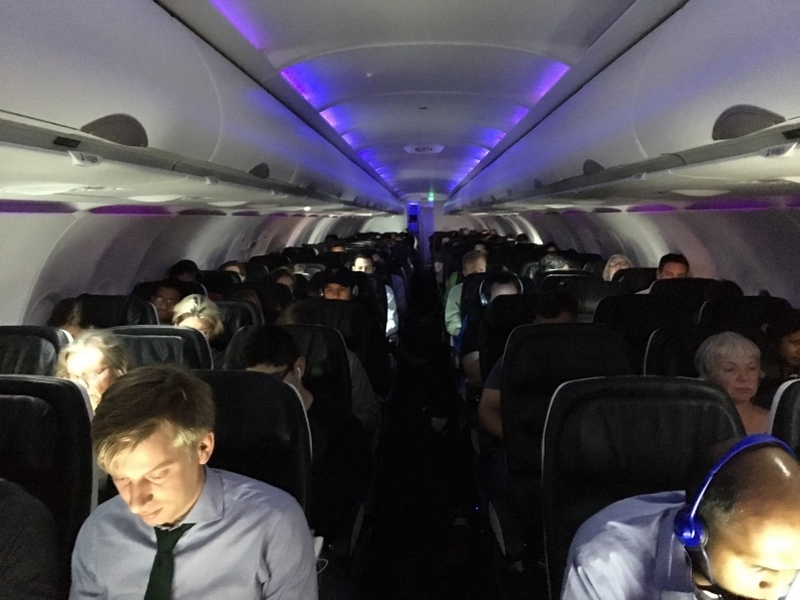 Virgin America has done well to build a brand image of a young, customer-focused airline, and it met the high expectations its marketing had built in my head on my first flight with them. The cabin crew were friendly and funny, calling themselves Bubbles and Chocolate Chip throughout the flight. The service was non-intrusive but present when called. 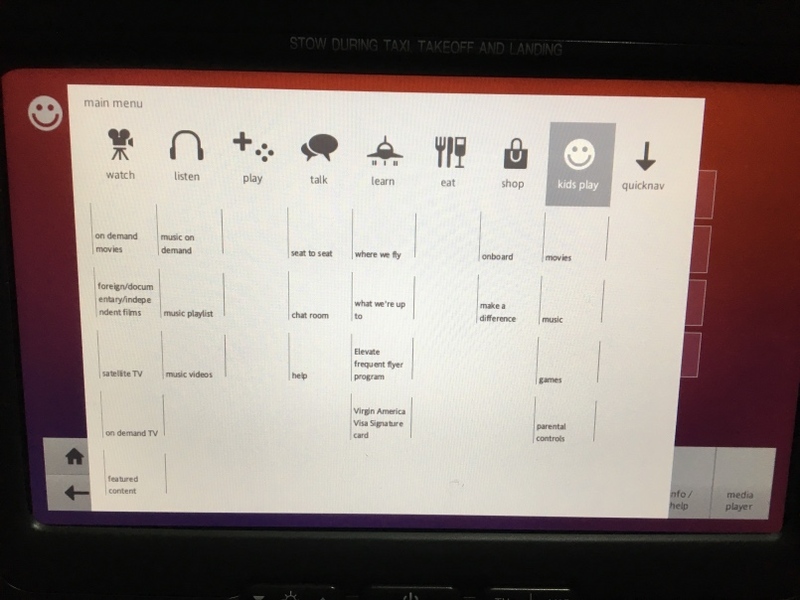 Virgin America’s website is user-friendly and the boarding process was efficient, departing five minutes ahead of schedule. 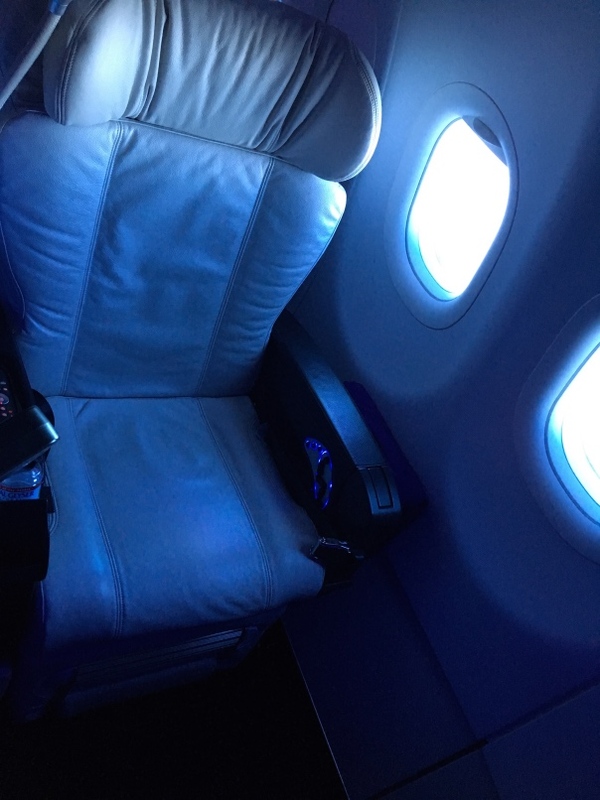 The seat is comfortable, but what takes one star away from this review is that it is not lie-flat nor does it offer direct-aisle access, something that JetBlue has introduced on its Mint coast-to-coast service. 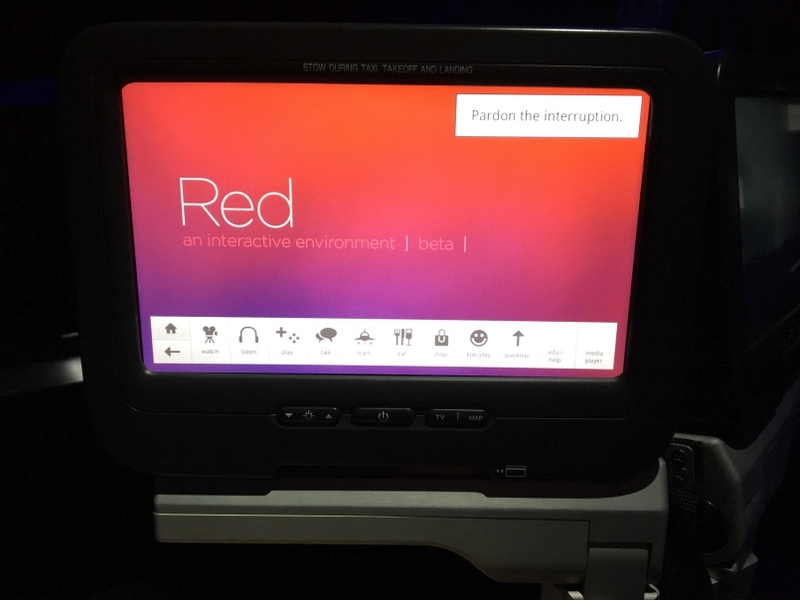 I would highly recommend flying Virgin America ‘First’ Class over the three US legacy carriers – Delta, American and United – but if JetBlue is also operating on the route you are looking at, the US blogs are going crazy over its Mint service and that would be a good one to experience too.